While champagne seems eternal and unchanging, its fame is in fact the product of four founding myths. What made a simple wine grown in a fairly mediocre wine-growing region one of the most prominent and enchanting icons in the world today? How did champagne, against all expectations, acquire such a prestige, becoming the ultimate sign of celebrations world-wide? No wedding, business deal, sporting event or art exhibition would be complete without it. Champagne’s success cannot be explained by its intriguing bubbles alone, so how did it become the ultimate symbol of celebration worldwide? Looking for answers, I decided to examine the past 250 years of champagne marketing to discover what it can teach us about the ever-changing image of champagne and its place in consumer culture. Champagne’s undying fame is, in fact, the product of four founding myths. These have shaped its identity and the images now associated with its consumption. The marvellous history demonstrates the power of collective myth-making in knitting and reknitting brands into the cultural fabric of society. Initially, the Champagne region of France was better known for its wool than its wine. The most northern wine-growing region in France, it was not considered appropriate for producing high-quality wines. In fact, local wines were often given as a promotional gift to customers of the wool trade. It was the Benedictine monks who began to improve the quality of wines from the Champagne region, selling them to fund their monasteries. Contrary to popular belief, however, the monks did not “invent” champagne. It wasn’t until much later that Pierre “Dom” Pérignon (1635–1713), head of a monastery in Reims, was integrated into the origin myth as part of a deliberate marketing strategy to highlight notions of heritage, authenticity and tradition associated with champagne, and secure its place in an increasingly competitive market. So who invented champagne? No one, in fact, as the formation of bubbles is natural for all wines. It really began to flourish when wool producers, receiving more and more orders for champagne, saw an opportunity to leave the wool industry for what appeared to be a more promising and profitable business. But the myth of a magic elixir, invented by holy men, has endured. 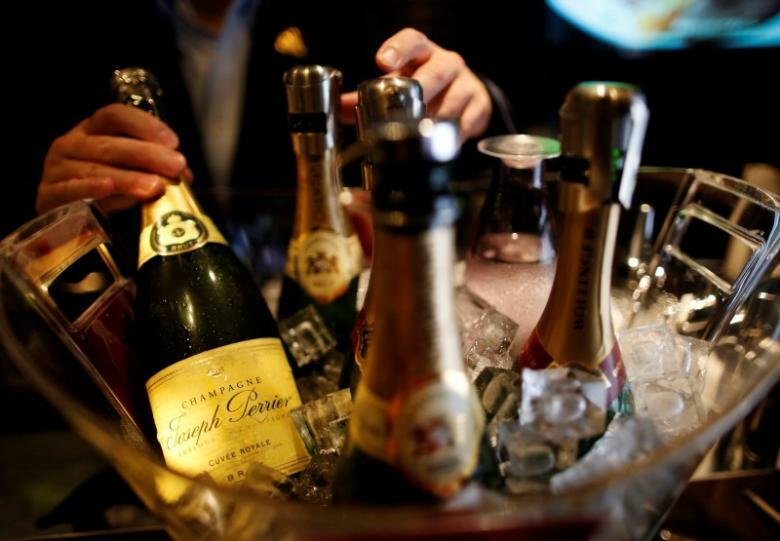 The second myth that grew up around champagne is that of opulence. The fact that champagne is seen and marketed as a luxury product is the result of a happy coincidence, dating all the way back to the year 496. Clovis, king of the Franks, was baptised into the Christian faith in Reims, the home of champagne. From that time on, tradition dictated that all French kings be crowned in Reims, and coronations were accompanied by sumptuous feasts, where the local wine, champagne, flowed freely. This tradition explains why champagne is known as a festive drink, sipped by those of privilege. This image was cemented when, at the age of sixteen, Louis XIV, the most opulent monarch of all, first tasted champagne in the magnificent cathedral of Reims. The Sun King was the one would associate champagne with his other obsessions: fashion, prestige and luxury. The industry caught another lucky break when Louis XV authorised the transport of champagne (and only champagne) in glass bottles rather than wooden barrels. This made all the difference for producers, because the wood let out the gas that gave champagne its bubbles, making it go flat. This new law also contributed to the development of champagne’s carefully designed packaging, one of the first instances of modern marketing. Labels featured well-known figures such as Marie-Antoinette and Jeanne d’Arc, as well as victorious military officers, nobles, artists, and other celebrities. Vendors quickly understood the value of graphic design to increase their brands’ renown and arouse desire in their expanding and increasingly wealthy client base. In 1789, the French revolution and its guillotine severed the connection between champagne and monarchs and aristocrats. Yet the revolution brought on the third, and perhaps most powerful, myth-making cycle, directly associating champagne with the “soul” and character of the new French Republic. Champagne had already gained enough renown to be seen as a national symbol, a worthy collective success. Champagne had become not only “the shining reflection of our nation”, according to the famous words of Voltaire, but also the “most glorious expression” of French civilisation. It was under the French Empire that champagne really came into its own. Napoleon used it wine to help him create a new bourgeois society that was both industrious and loyal. Jean-Rémy Moët established Moët in the United States, attracting a new set of clients, including President George Washington himself. And when the Russian army routed Napoleon and reached the city of Reims, the enterprising Clicquot “Widow” opened her champagne cellars to the invaders in the hope of conquering the Russian market. These strategies proved successful. Following the fall of the French Empire in 1814, the dawn of the industrial revolution was the start of a veritable golden age for champagne. As rail lines spread outward, champagne could be transported further, in greater quantities and to new markets. Innovative equipment enabled more efficient production and improved quality, both in terms of aesthetics and taste. It quickly became a symbol of France in the eyes of the world. This period was also marked by an increase in the production of imitation champagne in other countries. The Champagne region’s signature sparkling wine was granted international recognition in the 1930s, protected by the appellation d’origine contrôlée (AOC) certification. 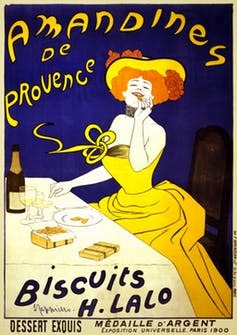 From the early 1900s, champagne advertising took on modern symbolism. During the Belle Époque, ads for champagne often featured modern marvels that dazzled the growing middle class – steamships, hot-air balloons, automobiles, planes and more. It is no coincidence that champagne was served at the 1889 Paris Universal Exhibition, when the Eiffel Tower was unveiled to the world. It became ubiquitous at ship launches and on transatlantic voyages – including on the Titanic – and at the closing of business deals. It was the subject of the world’s first film advertisement, and became a symbol of modernity at a time when France was trying to forget the horrors of WWI and turn towards a promising new age. When competition came from Italian prosecco and Spanish cava sparkling wines, advertising for champagne adapted, emphasising its history and heritage, endowing it with unique prestige to distinguish it from its lesser rivals. At this time, Moët created the Dom Pérignon “myth” to promote his premium brand. In contemporary times, James Bond, Audrey Hepburn and, more recently, Beyoncé and her husband Jay Z have been associated with the myths and history surrounding champagne. This is the ultimate proof of its continued relevance and iconic attraction in global markets. Through collective myth-making, champagne has not only managed to take advantage of favourable social and cultural trends, but also to navigate deep cultural contradictions and continue to sparkle in our collective imagination. Translated from the French by Alice Heathwood pour Fast for Word.